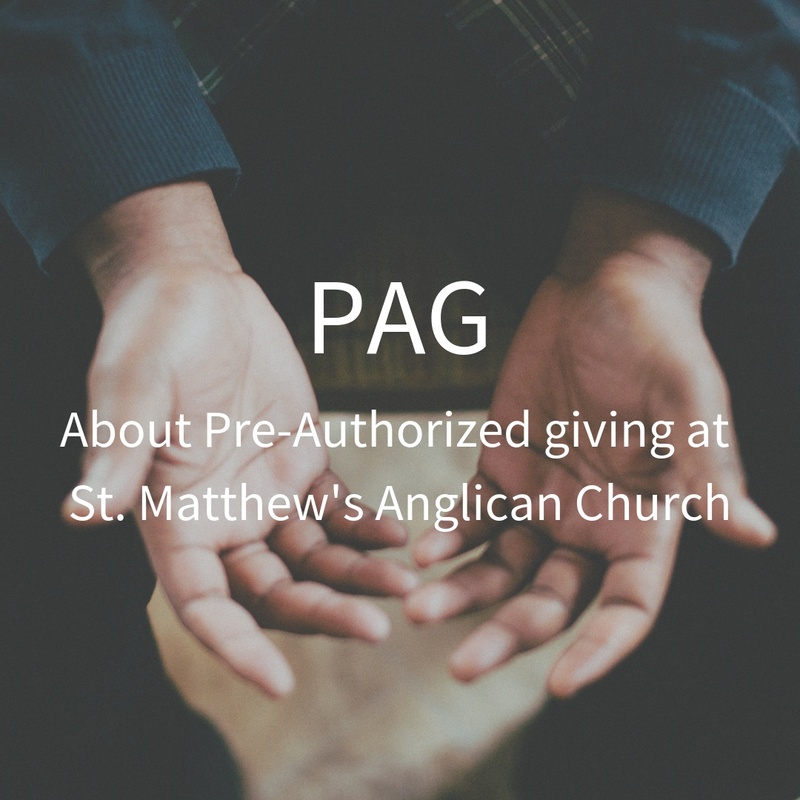 PAG is one option for giving to St. Matthew's Anglican Church. Through PAG, automatic payments are made from either your bank account or major credit card to support the ministry of St. Matthew's. There is no additional charge to you. To enroll, please download, complete, and print the form below and return it to our church office, or place it in the collection plate on Sunday. St. Matthew's has ongoing commitments that need our regular support. Because the church is important to us, we are each called to make a financial commitment to enable the ministry of our church flourish. Pre-authorized giving (PAG) makes it easier for us to fulfill our commitment. Why should I use PAG? It helps you put God’s priority before your own. By giving first to God before yourself, you have consciously given sacrificially as God has taught us to give. PAG helps you budget your support for the church, in the same way you budget your household expenses. It ensures your support will be continuous even if you miss a Sunday at church. As well it prevents your need to catch up if you are absent and unable to make your regular donation. It eliminates the need to keep track of your envelopes or the need to remember to make your offering. How does PAG help St. Matthew's? It helps our financial staff manage the cash flow and administer the budget throughout the year. It reduces the time spent by volunteer counters on bookkeeping and paper throughout the year. How do I sign up for PAG? Decide how much you want to give each month. Download, complete, and print the PAG enrollment form above. Hand in or email the form to our church office, or place it in the Sunday offering. Starting the following month, your offering will be automatically paid from your account. It will also be included on your annual charitable donation tax receipt. How do I change or cancel my PAG? If you wish to update your PAG, please submit a new form. We recommend you review your PAG every year. If you need to cancel your PAG for any reason, please contact our church office, who will ensure the cancellation of your PAG in strict confidence.